Columbia Public Schools (CPS) is set to hold a no-tax-increase bond issue for the remaining $5 million needed in funding a new middle school on Sinclair Road that will feed into RBHS. The bond issue voting will take place on April 3. The middle school comes in an effort to accommodate the continued growth in south Columbia, CPS Director of Community Relations Michelle Baumstark said. CPS hope to solve the packed school district with a new southwest middle school in 2020, two years earlier than originally planned, Baumstark said. CPS purchased land on Sinclair road following the 2016 bond issue election, which approved funds for the new middle school. Several decisions regarding attendance logistics have yet to be finalized, and boundary lines are expected to be a focus of upcoming CPS action. Currently, students of the southwest middle school will graduate to RBHS, Rukstad said. 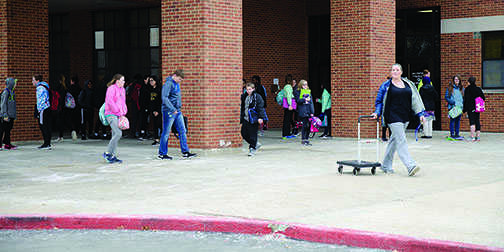 For some students at Gentry, the change cannot come soon enough. Danny O’Toole, an eighth grade student at Gentry, describes the classroom environment as often chaotic and packed. O’Toole recalls one instance of particular chaos for a substitute teacher. Graduates of Gentry agree with O’Toole’s concerns. Sophomore Raiyan Yousuf attended Jefferson Middle School for sixth and seventh grade but had to move to Gentry after a boundary line change and noticed a stark difference between the schools. Both CPS administrators and students look toward the new middle school as an outlet for community growth. Columbia and RBHS will see the impacts of the change within the next few years. Ben Kimchi is the Arts and Entertainment editor for The Rock and Bearing News. He is an active member of the debate team and chamber orchestra, and loves listening to a good playlist.